Apollo Hospitals Enterprise Ltd. (BSE: 508869) (NSE: APOLLOHOSP), India's first multi-speciality chain of hospitals, today opened the Apollo Proton Cancer Centre (APCC), giving cancer patients access to a specialised form of radiotherapy that is extremely precise in destroying cancer cells. 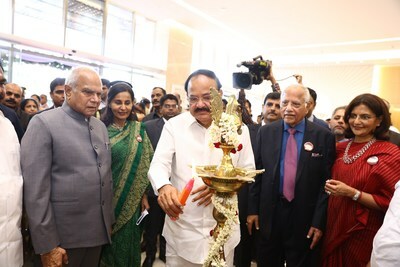 The Apollo Proton Cancer Centre was inaugurated in Chennai by the Hon'ble Vice President of India, Shri Venkaiah Naidu. It was in 1983 that Dr. Prathap Reddy made a pioneering endeavor by launching India's first corporate hospital - Apollo Hospitals in Chennai. Over the years, Apollo Hospitals has established itself as home to the largest cardiac practice in India with over 160,000 cardiac surgeries. Apollo Hospitals is also the world's largest private cancer care provider and runs the world's leading solid organ transplant program. As Asia's largest and most trusted healthcare group, its presence includes over 10,000 beds across 71 Hospitals, 3000 Pharmacies, over 90 Primary Care and Diagnostic Clinics, 110 plus Telemedicine Centres.